A few years back I became rather interested in music video compilations. No, not fan made stuff, but official collections of music videos put out by Japanese companies. 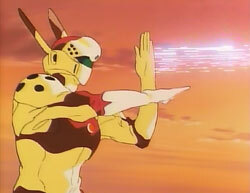 A few have been released in the west, the two “Bubblegum Crisis” ones released by AnimEigo, are probably the most famous, but also the Right Stuf released the “Irresponsible Captain Tylor” music videos and Aniplex USA released the first volume of “Gurren Lagann Parallel Works” split over the extras of the two Gurren Lagann movies. There’s ton of music video compilations unreleased in the west, and I plan to highlight one a month. Like a lot of music video compilations, this one contains exclusive animation. In this video it’s spread out into six sections between the music videos and runs about eight or so minutes in total. 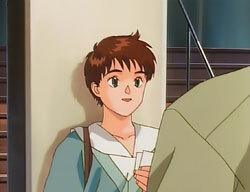 It follows the lead character of the series, Noa Izumi, pilot of the Unit 1 Labor, known affectionately as Alphonse, on her day off (hence the title “One Day of Noa”). These short pieces have no dialogue or music, just sound effects. In this part Noa is rudely woken by her alarm clock, gets out of bed, cleans her teeth and gets dressed. She leaves her apartment, but returns a few moments later to pick something off the table she’s forgotten. Passing the mirror on the way out she notices her hair is a mess and fixes it before she leaves. This is the full length version of the second opening theme song from the TV series. It was first released as a CD single in August 1990. While the first part of the video clip is mostly from the first TV episode (in which police cadet Noa jumps in Alphonse as it is being stolen and apprehends the criminals), the majority is taken from a variety of TV second series OVAs. This is the opening animation theme song for the original 1988 OVA series. Written by Kenji Kawai, the lyrics are about Noa’s feelings towards Alphonse (she’s a bit of a mecha freak). As you can probably tell, Hiroko Kasahara sung many of the songs for the series. This song was first released on the very first Patlabor album soundtrack, “Interface”, in March 1988. Not only does the video contain scenes from the original OVA series, but is also contains a few shots from a commercial for Patlabor AXIA audio tape. This 30 second commercial had Noa sleeping in some sort of darkened futuristic cave you’d find in some cheap fantasy sci-fi OVA of the mid 1980’s. She dreams of piloting her Ingram and cutting up asteroids with a light sabre. After which she awakens and a cassette tape pops out of the machine in front of her and floats above her face, which she then takes a hold of. It’s truly bizarre when compared to the near future realism of the Patlabor universe. 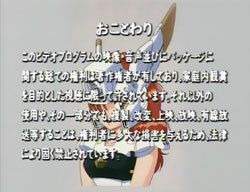 The commercial was only available on the initial video releases of the original OVA series. Strangely it never appeared on any re issues of the series beyond 1992. Kawai who is probably best known for his atmospheric scores of the “Ghost in Shell” movies did all of the background music for the series. A number of those pieces appear on this compilation. Like the title says, this video contains footage relating to the TV episodes where rogue Labor manufacturer Schaft appears. In particular it focuses on the menacing Griffin Labor, it’s young male child pilot Bud and it’s developer, the eccentric Richard Wong. There is some dialogue in this video at the beginning and end, but it’s the same dialogue from the TV series and not new stuff. While credited as being an instrumental, there is a simple chorus which is sung by Miho Matsuba. The end of “Schaft!” segues into this video. As can probably guess from the title, this video uses highlights from the two Griffin arcs, the one in the TV series and concluding on in the follow up OVA series. These arcs are probably the most popular in the TV series and second OVA series. 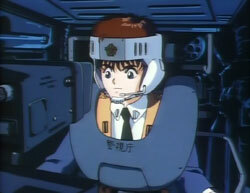 Both Kenji Kawai songs first appeared on the “Patlabor Phase II: Asura from Schaft” album in May 1990. Noa grabs lunch at a corner shop which she eats there and leaves the wrapping. This video highlights one of my favourite episodes from the second OVA series; “Our Karuizawa”. In it the captains of the two Police Labor divisions, Kiichi Gotoh and Shinobu Nagumo attempt to return to the Police Labor hanger but get caught up in the middle of a typhoon. The only places they can find nearby to shelter overnight are love motels. Gotoh has always had a thing for Shinobu, and Shinobu is uneasy about the situation. Hilarity ensues. The instrumental was first released on the album of the same name in September 1990. This is the third and final closing theme song for the second OVA series. The video begins with the final scene from the last episode of the series and then a montage of scenes from the final TV episode. Very melancholy. Believe it or not, the lyrics for this song were written by Masami Yuuki, the creator of the series and manga artist. The song first appeared as a B-side to Norihiko Tanimoto’s “Idling For You” (the third and final opening theme song for the second OVA series funnily enough) CD single in January 1992. At a crossing, Noa is asked by an old lady for directions. But the old dear is still confused where to go, so Noa ends up taking the old lady all the way to her destination. She is now late and rushes back to the crossing. She decides to jay walk, but a police officer catches her before she does and embarrassingly reprimands her for it. The very upbeat song is the first opening from the second OVA series. It’s a Kenji Kawai song performed by Noa’s voice actor, Miina Tominaga (she was also Yahiko Myoujin in “Rurouni Kenshin”). The initial animation is edited from the two underground episodes from the TV and second OVA series, where the team battle albino crocodiles in a sewer under their hanger. The video also takes the best scenes out of the two parody episodes from the series; “Long Live CLAT” from the TV series which is mostly a parody of “Captain Scarlet”, and “The Woman Who Came from the Stars” from the second OVA series, which parodies mostly the final episode from the 1966 TV series “Ultraman”. The song first appeared on the mini album “Patlabor Theme Collection Special” in March 1991. This instrumental piece is set to scenes from the second OVA episode “Snow Rondo”. The episode revolves around Asuma Shinohara, Noa’s police partner and back up while she’s piloting Alphonse. It’s a strange kind of episode where goes to a school reunion and sees a woman whom he had a crush on in school. Asuma finally gets up the nerve to ask her out and they go on a date. Except they didn’t and none of this happened! Or it did… Or maybe no one’s seen her for years, or something. As I said, it’s a strange episode. The music first appeared on the mini album “Patlabor Theme Collection Volume 2 Kenji Kawai Special” in March 1992. Noa gets on a train, but falls asleep and misses her stop. Scowling, she then has to take the train back to station she should have gotten off of. This is the full length version of the first opening of the TV series. The video uses scenes from the two “drunk” episodes from the TV series and second OVA series. To explain a bit further, in one TV episode Gotoh takes his crew to a bar pretty much to drink themselves stupid to sort out their differences. This is repeated in the follow up OVA series, except the venue changes to a hot spring resort. Mamoru Oshii wrote the TV episode. The song first appeared on CD single in December 1989. 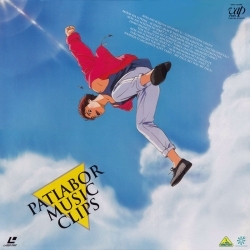 This is the only music video in the collection to use footage from one of the film, which in this case can only be “Patlabor the movie” (the second film was released a year after this music video compilation was put out). Now the song comes from quite an obscure source; the Patlabor the movie Tickemaga. It was a pre-purchase movie ticket (Ticket/Magazine = Tickemaga) which came with a CD single, booklet and mini-poster a few months before the film’s July 1989 premier. 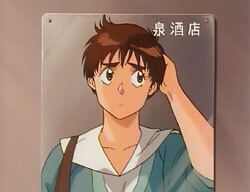 The song did not appear on any Patlabor album or compilation until 2010. Noa’s misadventures have made her quite late now, so she decides to take a short cut. She leaps over a barrier leading into a park, and manages to trip over it, falling flat onto her face. Noa then decides to duck down an alleyway, but bumps into a delivery boy on a bike, knocking him over and smashing the bowls he was carrying. She apologises and pays for the damage. Finally Noa arrives at her destination, a concert hall. While she waits she pulls out two tickets to the “Patlabor Concert Tour” out of her purse. Though it’s a bit unclear someone who looks uncannily like Asuma arrives (but we never see his face, just the back of him) and they both hold hands (what?!) and go in. This meeting part is very quick, done in long distance shots and is deliberately hard to make out. The implication here is that Noa and Asuma are on a date, but of course nothing is made clear. “One Day of Noa Part 5” segues into this song. Which is of the real “Patlabor Concert Tour” which was filmed 5 May 1992 at the Tokyo Yomiuri Hall. The song is performed by Noa’s voice actor, Miina Tominaga with Kenji Kawai’s band. Kawai is playing guitar in this video and wearing some hideous shades and clothes. You can’t miss him. This video is pretty much a blatant plug for the “Patlabor Concert Tour ’92” video and CD release which would come out a couple months after this music video compilation. Luckily it’s the only live action clip in the compilation. We see Noa in the change rooms at work presumably the day after the concert. She straightens her tie and then closes her locker. The final scene has her and her fellow team members on the roof of the Labor hanger relaxing. The final video clip also serves as the end credits for the compilation. The video edits the best bits from the opening closing animations from the TV series and second OVA series. As they have obviously used the clean versions of these animations. From the viewpoint of a fan that’s a bit annoying as the clean opening and closing for the TV series and second OVA series have never been issued on home video ever. So at least at during the creation of this compilation in 1992, the clean versions of the opening and closings existed. One really has to wonder why they have never, ever been issued on video. The music for this video was used for the first closing theme for the second OVA series and first appeared on the “Patlabor Theme Collection Special” mini album in March 1991. Attentive viewers might notice the video copyright screen after the compilation finishes has an unusual background. The picture underneath is of a character called AV Girl (I think that’s what she’s called…). It is a character created by Masami Yuuki as a parody piece for the P-Club Extra booklets. They were a short lived series of very glossy pamphlet style magazines produced by Bandai Visual for members of P-Club, the company’s official club for the anime, and essentially a marketing tool for video release of the TV series and second OVA series. The second booklet in the series has six pages devoted to the parody piece. There’s not a great deal of information about this project outside this booklet and a few sketches in an artbook published in 2008. I think it was confined to the P-Club booklet only. The laserdisc version comes with an insert which includes a drawn SD version of Kenji Kawai. Unfortunately when I acquired my LD copy a few years back, the insert was missing. Apart from the additional animation which runs less than 10 minutes (and as a bonus don’t require subtitles), the compilation is probably for a fan of the series rather than a casual fan. The videos are adequately edited and produced, but not really outstanding. The music is pleasant enough and if you’re into early 1990’s Japanese pop, you’ll probably like the songs. The easiest way to get compilation is the “Patlabor Music Collection” DVD which is currently available in Japan and retails for a measly ¥1,995. It also contains the “Patlabor Concert Tour ’92” and a few other bonus extras.